Progress on the front of the house continues. The guys epoxied the lower part of the front, and then spent yesterday working inside while Woody got everything ready for them to prime. 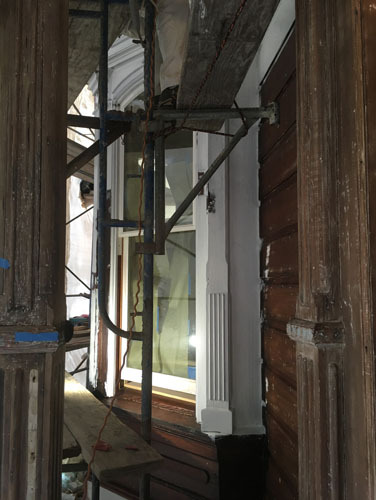 Basically, when Woody would otherwise hold his crew up waiting on him to finish up some carpentry work, he's sending them inside to start the interior painting. 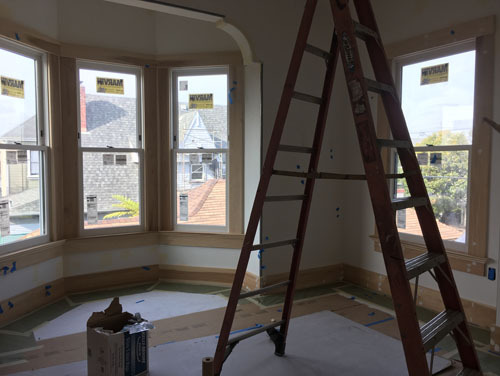 I suggested that he start with the two new back bedrooms, because there is no paint stripping to be done in there, and painting should be fairly straightforward. I have the ulterior motive of wanting to move things into those rooms once they are finished. Since they are not in the way of anything else but are accessible by the elevator, they would make a convenient place to stash things as we slowly move back. For the time being, until a parent needs those rooms, we will be using them as home offices (both Noel and I work from home), so it would really nice to get that all set up and settled. Also, I might just have bought a rather large floor loom recently which is currently jammed into the elevator pending a safe, clear space to put it. There's a lot of prep to be done before painting, though. 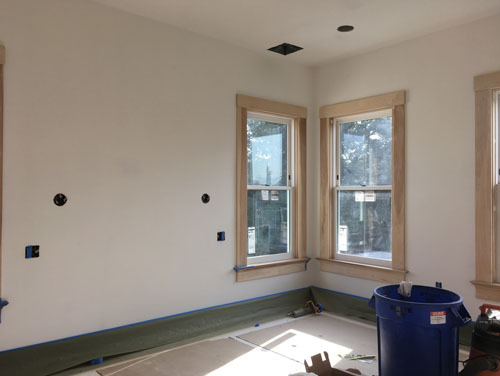 Unevenness in the walls and nail holes in the trim need to be filled, and over the last couple of weeks Woody has gone through the rooms and marked everything with tags of blue tape, then his guys come after him filling and sanding. He's going to take the windows out for painting next week, while the weather is still cooperating (I warned him about how having openings in our house affects the weather, of course). Anyway, having gotten his own work caught up, he had the crew back on their top priority today which was the front of the house. That's Woody's son up there, priming away over the epoxy. After months and months of stripping, sanding, filling, and carpentry work, the epoxy/primer stage goes really fast. 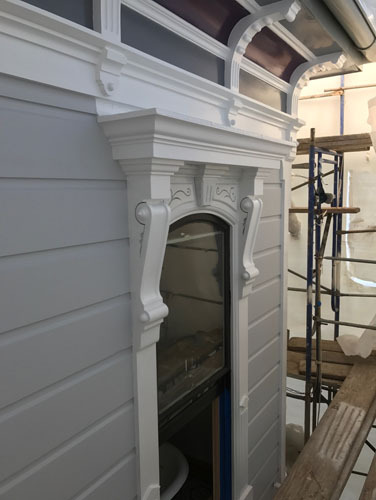 Once we see what the front bay looks like with the colour scheme we have worked out, we can make a final decision on what the final coat will look like.